First of all we are a Real Florist, Real Flowers and Real People with Real Knowledge. 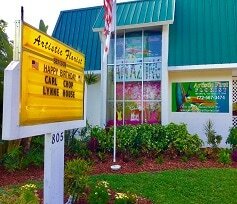 Our shop has been here in downtown Vero Beach since 1963 and is family owned and operated by Aimee and Frank Dzama. Aimee Dzama leads a talented and experienced staff of floral designers, dedicated to making your floral wishes come true. 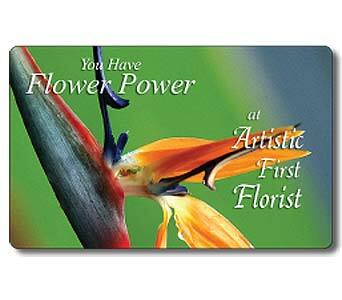 We offer a wide selection of only the freshest flowers from all over the world. We also offer Florida grown and designed ceramic dish gardens and green plants for the home or funeral services. At Artistic we are proud of our beautiful and high quality flower designs and stand by each and every order with a 100% satisfaction guarantee. We treat your order like it is the most important order we have....because it is! We are a member of the Vero Beach Chamber of Commerce. *Our shop is open: Monday - Friday 9:00 a.m. to 5:00 p.m. Saturday 9:00 a.m. to 12:00 p.m. Serving the entire Vero Beach area, All of the Indian River County including John's Island, Orchid Island, Indian River Shores, Gifford, Wabasso & Sebastian. Our 24 Hour a day phone service is always available to help you with your order. You can also contact us by Email at flowers@artisticfirstflorist.net or call us at 772-567-3474 or toll free at 800-879-6766. We're always here to serve you and make your flower-sending experience a pleasure. SAME DAY DELIVERY is always available on orders that are placed by 2 P.M. Monday-Friday in our local Delivery area, at no additional charge. Orders placed after 2 P.M. can sometimes also be Delivered on the SAME DAY, call us and we will do our very best to accomodate your request. ONE HOUR DELIVERY is usually possible for an additional fee. A local delivery fee of $13.95 will be added to each order, for each address. Outside local delivery area fees may vary. WE DO DELIVER to cemetaries, Call us and we will be glad to help. A photo of your arrangement, silk or fresh, will be sent to you, our compliments. SUNDAY DELIVERIES are available for special occasions, call us for details and verification. Special delivery fees apply. We do not normally make deliveries on Sunday, this is a special service available ONLY for unique situations, and cannot be arranged by internet ordering. We are happy to help with and accept international orders if you call our shop directly, we cannot accept international orders through the internet.